The spy shots, teasers, and speculation are finally over, the long-awaited mid-engined Corvette will finally make its debut on July 18th! This is huge news because the Corvette will be ditching the front-engined rear-wheel-drive layout it has used since its inception back in 1953. The current C7 generation car will be the final iteration of the Corvette as we have always known it, which should make it a historically significant car for sure. It will be cool for C7 owners to say they have an example of the last front-engined Corvette ever (assuming the C8 will be mid-engined-only) but now General Motors will offer up the opportunity to truly own the last front-engined Corvette when it goes up for auction this summer. The Stephen Siller Tunnel to Towers Foundation was named after a New York City firefighter named Stephen Siller, who died on September 11, 2001. The foundation builds mortgage-free smart homes for injured service members and helps pay off the mortgages for the families of first responders killed in the line of duty. The final C7 Corvette will be a black 2019 Z06 model, but we don't know if it will be a coupe or convertible and what transmission it will have. 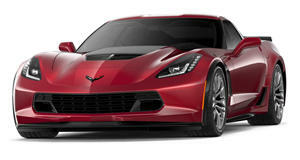 It's interesting that the final C7 won't be one of the recently-announced Final Edition models or the most powerful ZR1. We still expect the car to bring big bucks for charity and be historically significant as the last of an era.